A Very Addictive and funny physics based bow and arrow shooting Game. The characters in the game are intentionally made funny, comical and stupid to make you laugh and let you have loads of fun. Relax and enjoy the some of the most hillarious animations you saw on iphone! Believe us, you will have more fun missing the rope and hitting the funny friend hung till death :). Save your buddies from being hanged! 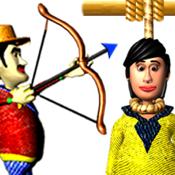 Your goal in this fun Archery shooting game is to shoot the rope and save your buddy from being hanged. Don’t miss or you might end up hitting your buddy. Each level positions you further away thus increasing the difficulty. A Great Game for all the Archery Lovers.